The sections can be expanded or collapsed by clicking on the black triangles next to the section title. The blue triangles bring up a context menu with editing functions (e.g. create a copy of a description, delete a concept). Snow Owl can be set to operate in authoring and browsing mode. A toggle button enables the switching between authoring (stated) and browsing (inferred) views. The selected view is applicable universally throughout the application. 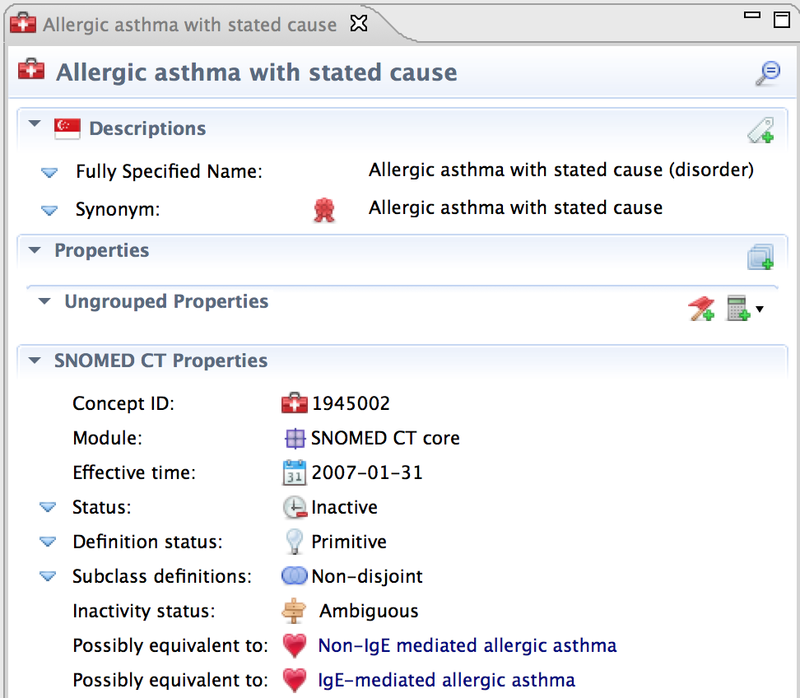 By changing between the two different modes the SNOMED CT concept editor switches to display stated and additional characteristic types by selecting authoring mode or to displaying inferred characteristic types by selecting browsing mode. When authoring mode is selected, the editor allows modifications on the concept by enabling the addition of both sanctioned and unsanctioned attributes. The attribute editing fields are powered by the machine readable concept model (MRCM), where for any particular concept domain, various attribute and concrete domain constraints are specified. The editing is not limited to these attributes only, as the user can always deviate from the model if necessary. When selecting to create a new concept, the mode automatically switches to authoring mode. This section displays the descriptions associated with the concept. In the left column you can see the description type (here: Fully Specified Name, Full Name, Synonym), in the right column the description term (e.g. 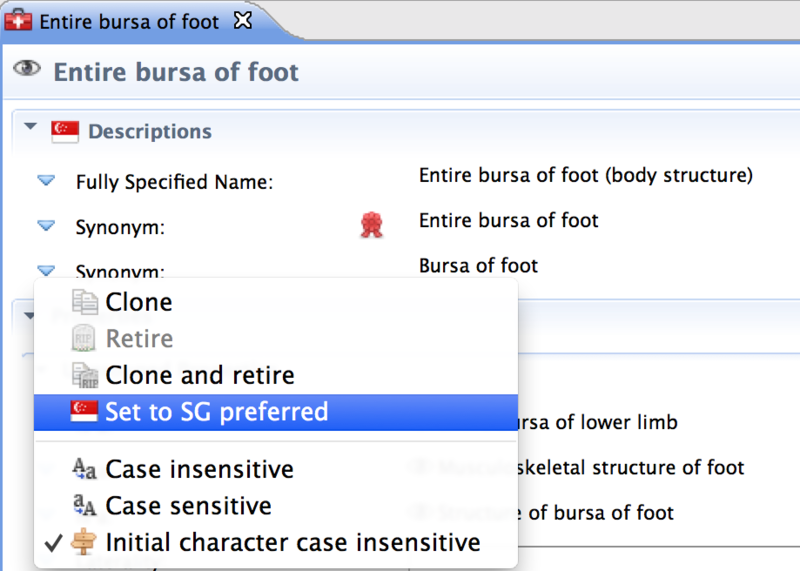 Entire bursa of foot). Longer descriptions are presented on multiple lines. The rosette icon indicates the preferred term. The flag on the section heading shows the currently active language dialect (here: Singaporean English). Clone: Create a copy of the description. Retire: Retire a published description by setting it to inactive. May this description rest in peace. Set to preferred: This option will set the selected description as the preferred description for the currently active language. Case sensitivity: The bottom menu section allows setting the description's case sensitivity. A checkmark indicates the current setting. The descriptions section will automatically create entry fields for all description types in the concept model. These are displayed as empty fields. For example, if the concept model requires two "Search keyword" description types to be present based on the concept's parentage or reference set membership, then two "Search keyword" fields would appear in this section. A description tag icon allows adding additional unsanctioned (i.e. not defined in the concept model) descriptions to the concept. For a more detailed view of all the descriptions associated with a concept go to the Descriptions page by clicking the tab on the bottom of the editor. The properties section displays the concept's relationships and datatype properties. The property type (here: Is a, Active ingredient, and Dose form) is displayed on the left, the property value (e.g. Amoxicillin) on the right. The concept model influences the actions that are available for a particular property. For example, the concept model specifies that one and only one "Clinically significant" property may appear. Therefore cloning a property is not allowed (as there would then be two properties) neither is retiring the property (as there would then be zero properties). This way, Snow Owl prevents you from making mistakes. A big time saver is that the properties section will automatically create entry fields for all relationships and datatype properties specified in the concept model. That means that you can focus on entering the values rather than trying to determine what properties are appropriate for the particular type of concept you're working on. For example, if the concept model specifies that a Dose form relationship must be present, an entry field for dose form will appear in this section (see screenshot above). 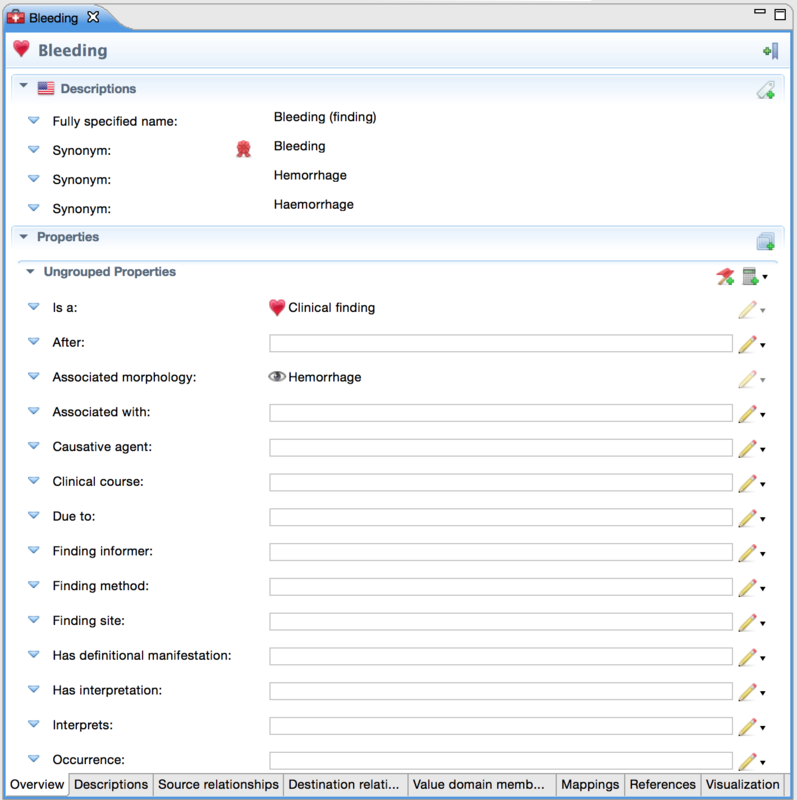 The valid values for the property are also specified in the concept model; in this example we see members of a dose form reference set displayed. The concept model can impose several other constraints (e.g. the relationship group that the properties appear in)--for more details please refer to the chapter about the concept model in the Snow Owl User Guide. For a more detailed view of all the properties associated with a concept go to the Source relationship page by clicking the tab on the bottom of the editor. 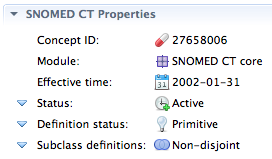 The SNOMED CT Properties section displays metadata about the concept. The fields in this section are always the same: Concept ID, Module, Effective time, Status, Definition status, and Subclass definition. Released components (concepts, descriptions, relationships) are identifiable by their effective time. It refers to the point of time when a new version of the component became effective, which is usually the date of publication. If the effective time is in the past, then that particular component has already been released. This section also displays additional information about inactive concepts when available. For example, concepts inactivated due to ambiguity often list alternate choices that may be equivalent, as in the example for Allergic asthma with stated cause shown below. The alternate choices are hyperlinks, so you can simply click on them to open the alternate concept in a new editor. 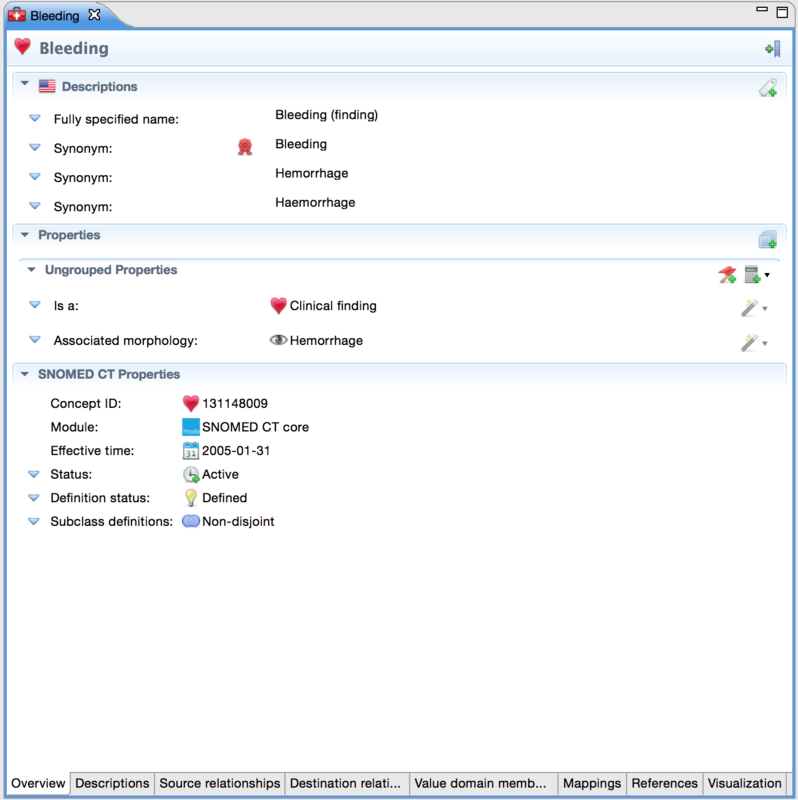 Clicking the blue triangle next to a SNOMED CT property displays a list of actions that can be performed on the property. The available actions vary depending on the property. Delete concept: Displays a deletion plan for the concept. Only unpublished components can be deleted. Inactivate concept: Displays an inactivation plan for the concept. Prompts for inactivation reason as well as a target component where necessary (e.g. when a concept is moved). The definition status can be set to primitive or defined. The subclass definitions property is an advanced description logic feature that declares that all subclasses of the current concept are mutually disjoint. 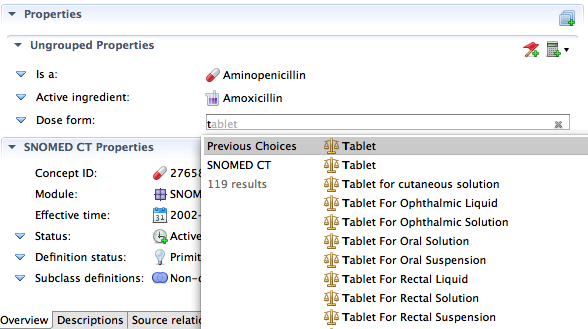 Unless you are working with the IHTSDO's proposed SNOMED CT Pharmacy Model or doing research on extending the expressivity currently used by SNOMED CT, you do not need to modify this setting. Inactive descriptions can be hidden or revealed by toggling the Show inactive descriptions button. You can add, modify, delete and inactivate descriptions on this page of the editor. You can add a descriptions using the button in the top right corner of the page. For instructions on how to add a new description, see the Adding descriptions section. There is also a button to delete a description . 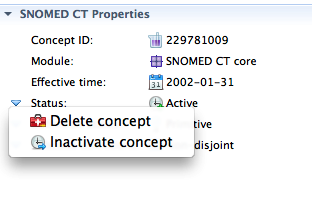 Before completing the deletion a confirmation dialog will pop up to show the components affected. Please note that only unreleased descriptions can be deleted. Alternatively, you can inactive a description by changing its status in the table to inactive. This operation is permitted for both released and unreleased descriptions. In accordance with IHTSDO rules, you are only allowed to change the case significance and the status of a description. You can edit these properties by selecting a description in the table and clicking on the cell you would like to change. Doing so reveals a drop-down where you can select the new value from a pre-defined set of concepts. Please note that editing of descriptions is also possible on the overview page. 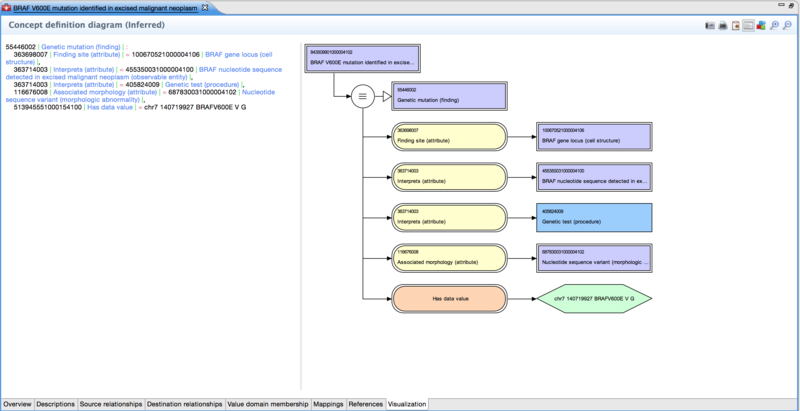 The relationships of a given concept are displayed on the Source relationships page and the Destination relationships page of the editor. Double-clicking a relationship will open the associated concept in the concept editor. Inactive relationships can be hidden or revealed with the toggle button. In accordance with IHTSDO rules, you are only allowed to change the status of the relationship. You can do this by selecting a relationship in the table and clicking on the cell you would like to change. Doing so reveals a drop-down where you can set the status to active or inactive. To delete a relationship click on the button in the top right corner of the page. A confirmation dialog will pop up to show the components affected by the deletion. You are only allowed to delete relationships that haven't been released yet. Alternatively, you can inactivate a relationship by changing its status in the table to inactive. This operation is permitted for both released and unreleased relationships. To add a relationship use the button in the top right corner of the page. For further instructions refer to the Adding relationships section. 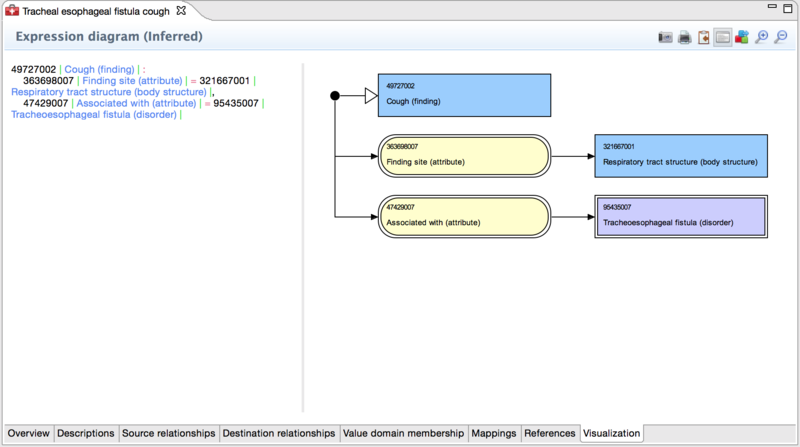 Please note that editing of source relationships is also possible on the overview page. Destination relationships originate from a different concept and point to the given concept. The selected concept is the target. The page is read-only, if you want to edit the relationships displayed here, you need to open the source concept. The Value domains, Mappings and References pages are read-only and display information related to the reference set membership of the given concept. Inactive relationships can be hidden or revealed with the toggle button. See the reference sets section for more details on how to add a concept to a reference set. Concepts are represented on the diagram by their Fully specified name and their identifier. The definition diagram is displayed by default, however you can switch between definition and expression diagrams using the toolbar icon. 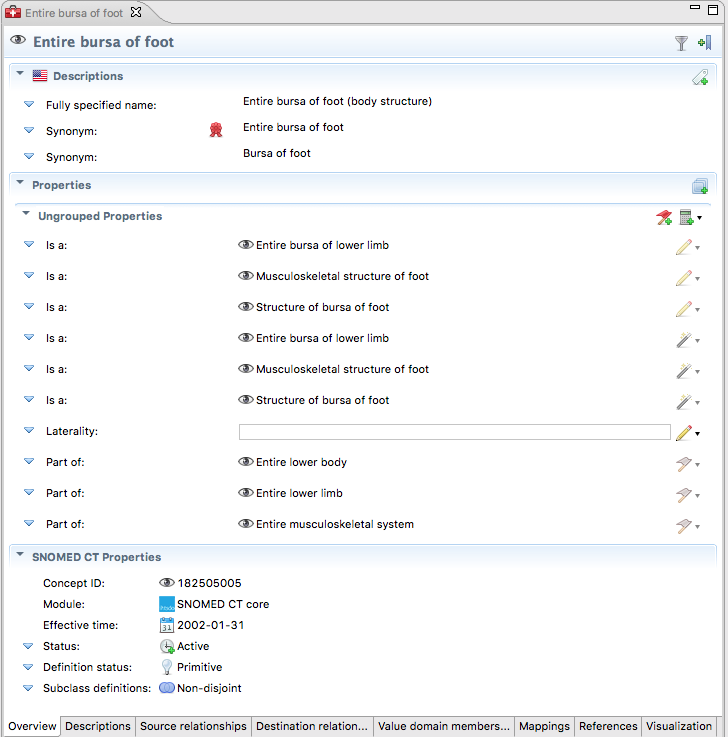 Both representations can rendered by either stated or inferred relationships toggled via the universal Authoring button in the application toolbar. Diagrams can be exported, printed or copied to the clipboard using the toolbar buttons. Zoom in/out is also available. Click the Show expression button to display the expression of the concept. Concept diagram is also empowered with concrete domain support. Both the concrete domains associated with the concept and the ones associated with a particular attribute are displayed on the diagram. Non-defining (additional) concrete domains are represented with single border, while defining ones (stated and inferred) are represented with double border. Concrete domains are distinguised from attributes by using different background color in the rounded rectangle. The value of concrete domains is displayed in a single bordered hexagon. In case unit is specified to a concrete domain value, the unit is also displayed in the hexagon.